Is ExpressVPN the right VPN for you? ExpressVPN is the fastest VPN on planet earth. At least that what the official website of ExpressVPN says. According to official sources, ExpressVPN is also the number one trusted VPN service in the whole wide world. But can ExpressVPN back that big claim up with big game performance? You’ll find that out soon enough. ExpressVPN, on the other hand, thinks that it can certainly give what it says it will give to new users. The VPN service is so confident in its product and service that it offers a 30-day money back guarantee to all users. If you’re an experienced VPN user, you must have come across tens of VPN services that offer money-back guarantees. 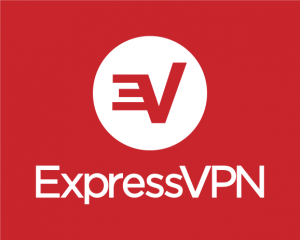 So what’s different about ExpressVPN? For starters, ExpressVPN money-back guarantee period is about six times that of other VPN service provider’s. Most of the premium VPN services in the market today offer, at max, a seven to ten-day money-back guarantee. Add to that the fact that ExpressVPN also works with Netflix and hence joins the ranks of rare VPN services that know how to manage Netflix VPN blocks. Express VPN service was launched in the year 2009 and quickly became one of the most respected VPN services in the industry. Now it is widely considered to be among the best VPN service providers in the world. With all that said, you might be wondering, is ExpressVPN the real deal? Does it do justice to its price? Well, that’s what we want to find out in this ExpressVPN review. ExpressVPN has gone under quite a few changes since 2016. Firstly, it has altered its policy of device type usage. Before, ExpressVPN did allow users to connect simultaneous devices but users were restricted to connect only one type of device at any given time. Now, users can connect any three devices of the same device simultaneously to ExpressVPN. In simpler terms, this means, that you can hook up three laptops to ExpressVPN at the same time. With other VPN service providers, you can’t do that. They force users to connect different types of devices. A typical combination goes like, a laptop and a smartphone along with a router. 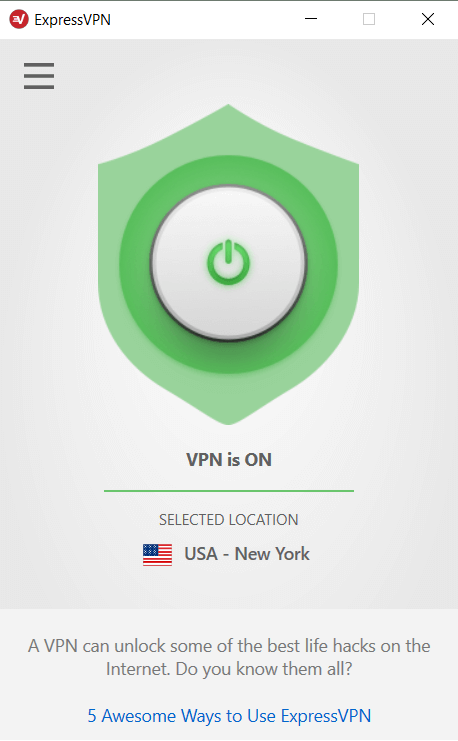 ExpressVPN has also introduced a brand new feature in its feature list with network lock. We’ll talk more about it in the forthcoming sections. ExpressVPN is not for users who are looking to meet their VPN needs on a budget. If you sign up for the service for a period of a single month, it will cost you $12.95 per month. That price tag is on the higher side. However, if you increase that duration to twelve months then ExpressVPN can be had for $8.32 per month. You may think that is pretty cheap, but it is not. Because some of the ExpressVPN competitors offer packages that come at half the price. ExpressVPN may be a high-quality VPN service, but it does charge quite a premium for its service. ExpressVPN is registered as a legal corporation in the British Virgin Islands. This put the VPN service beyond the legal jurisdiction of national and international law enforcement agencies. The NSA and GCHQ cannot put their hands on ExpressVPN. Moreover, all OpenVPN internet traffic is encrypted with 256-bit AES algorithm by default. So basically, all ExpressVPN users are as secure as secure can be. Do remember though that the default encryption settings for the ExpressVPN application cannot be modified. You can, however, change the VPN protocol if you want to. Officially, ExpressVPN does not record its customers’ activity. It means, the company does not keep any logs and neither does it monitor its subscribers. 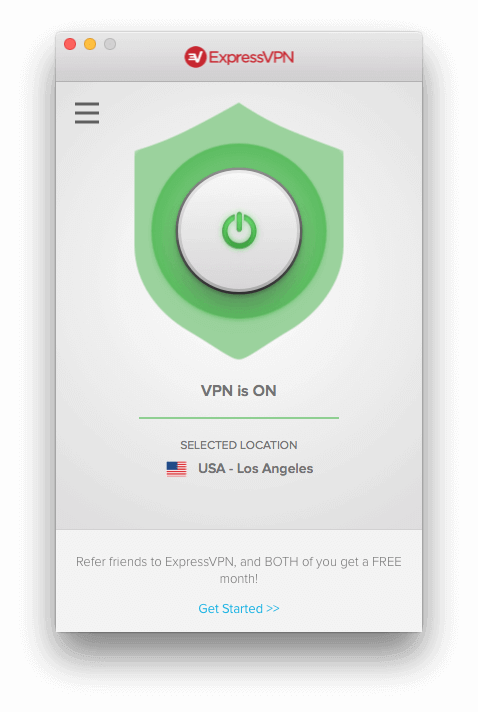 Users are free to utilize ExpressVPN however they like. ExpressVPN also provides an opportunity for users to view their connection logs which are stored on the local computer. There is also an option present which enables users to save logs to a local file. These type of log files are used to troubleshoot problems that may or may not arise. In the latest update however, ExpressVPN has rebranded this feature. The company now calls these “logs” as diagnostics. In the end, it doesn’t change the fact that both are just text files. So, in our view, the only reason ExpressVPN changed the name to “diagnostics” is because the term “log” tends to elicit negative connotations from the general public. Each ExpressVPN users is granted a static IP address. The obvious advantage of using a static IP address is that thousands of other users are using the same IP address. This “shared” IP address hence adds an extra level of privacy and anonymity to user accounts. Any organization that wants to snoop on a single user will find it impossible. Because thousands of users are accessing the internet from the same IP address. This creates a lot of noise. With noise, even the most established of snooping agencies will have to spend a considerable amount of resources to crack open a suspect’s user activity. So unless you’re Edward Snowden, you don’t need to worry about your internet service provider spying on you. But there is a downside to a shared IP address as well. More specifically, Netflix can discover and then block shared IP addresses much more quickly than otherwise. And for what it’s worth, ExpressVPN does not offer any other types of IP addresses. No dedicated IP address here. And there is no provision for private IP address either. All ExpressVPN plans offer more than 1000 servers which are located in over 78 countries. The average VPN service provider does not offer a number even near 1000. To clarify, ExpressVPN gives new users more option with regard to server variation than 99 percent of the other VPN service providers in the market. There are a few/rare VPN service providers who can rival that number but you don’t need to worry about them. Each package comes with a unlimited number of server switches and bandwidth. The usability category is where ExpressVPN scores its highest marks. First of all, in order to use ExpressVPN service, you need to sign up by visiting the official website. After that, you need to download the executable file from the official download. Or download the relevant file for your operating system. Then all you need to do is to install that file on your device and then run the application. The installation process is different for each device and operating system. When you sign up with ExpressVPN, the company sends you a link to a website page. This web page contains information about the installation process and some activation code. Remember that the message will be in the form of a confirmation email. So save it if you can. We won’t deny the fact that it is considered “time-consuming” to force users to go through such as process. A sign up should be enough. There is no need for a confirmation email and then a confirmation code. But if a single confirmation irritates you, then ExpressVPN has got some more tricks up its sleeves for you. You’ll have to perform the activation process for each of your devices. But it does come with its own advantages. When each device is activated separately, you will never need to spend time in logging in to any of your devices. You’ll just have to start the application and it will automatically sign you in. Then the only thing you need to do is to connect to a VPN service of your choice. 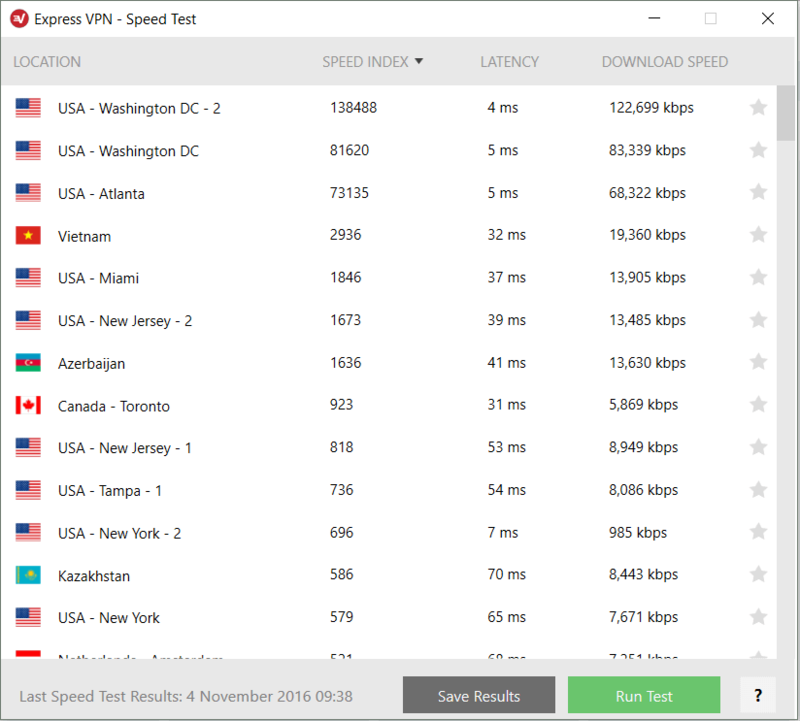 There is a neat little option of sending data to ExpressVPN in order to improve VPN speeds. This prompt will likely stare you in the face when you’re in the middle of installing the application. So if you want to participate then you can. Otherwise, pay no attention to it. What About The Application Itself? The ExpressVPN application is intuitive to use and designed in a simplistic manner. 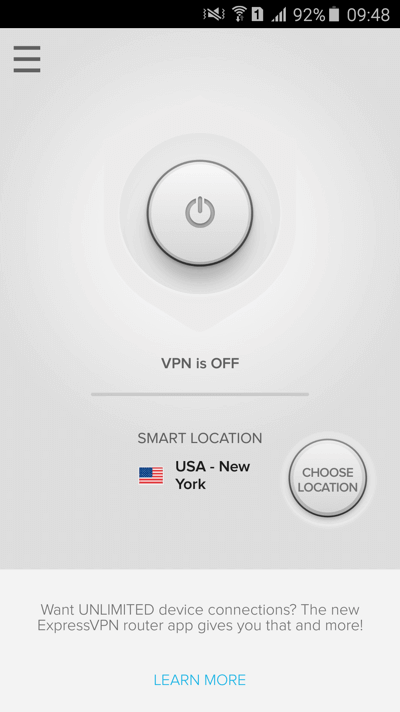 It is one of the most to-the-point VPN application we have used in recent times. All that a user needs to do is select a server (and star it if the user wants to) and then hit connect. If the user does star the server, then that server will become available via quick access menu. The options menu gives users a few elementary settings options. Users can change VPN protocols according to their preference. As you can probably imagine, if you don’t want to change VPN protocol then you’re better off ignoring this option. 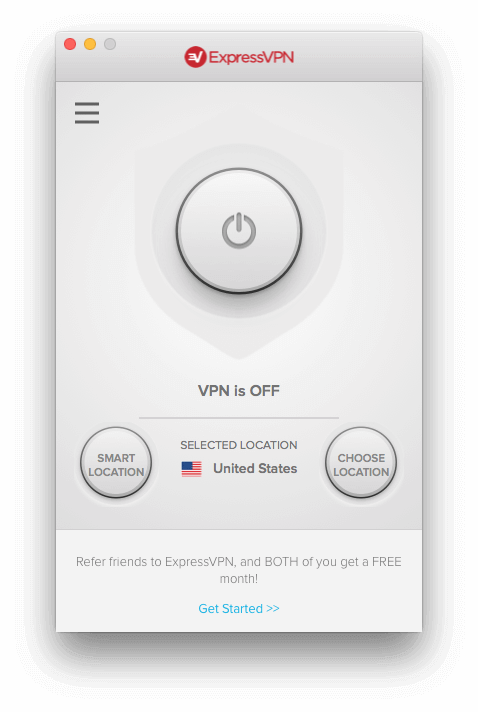 In short, the ExpressVPN application interface is plug-and-play. That is why it is one of the most user-friendly VPN application in the market today. Kids along with elderly people can easily learn how to use ExpressVPN application. With ExpressVPN, you can simply close the main ExpressVPN GUI and allow the application to run in the background. There is a system tray icon there as well in case you need to configure something without the main GUI. The system icon allows users to select their favorite servers. It also provides other options such as disconnect and options menu, if a user clicks on it. As mentioned earlier as well, you’ll have to activate all devices. That holds true for mobile application as well. The activation process, as before, is simple and easy to follow. There is no doubt about the fact that ExpressVPN put a lot of effort and thought into its ExpressVPN applications. Perhaps this is why all ExpressVPN applications are more or less idiot-proof. What Happens When You Want To Connect A Fourth Device With ExpressVPN? What we mean is that, there is a downside to ExpressVPN if you want to use a fourth device. Let’s say you have a tablet and a smartphone along with two PCs. You want to connect all four devices to ExpressVPN. With ExpressVPN, if you already have three devices connect to ExpressVPN, you can’t connect the fourth one just like that. Instead, you’ll have to do something else. Mainly, you’ll have to disconnect one of the three devices from ExpressVPN. The ExpressVPN won’t do the hard work for you this time around. If you want to connect the fourth devices, you’ll first have to make space for it by disconnecting it from the main ExpressVPN network with your own fingers. As you can already imagine, this can cause problems. Because if you left your office PC connected to ExpressVPN and then went home, then you can’t connect a total of three devices when at home. This is a massive waste or resources. Not to mention all the headaches. It would be better if the ExpressVPN application could automatically disconnect from the office device. And then make room for the new “fourth” device. ExpressVPN also offers a kind of firmware so to speak. Basically, you can use the firmware with any of your wifi routers and install ExpressVPN on them. Or, you can just buy a router that is preconfigured with ExpressVPN. Otherwise, just install the ExpressVPN router application without any charge. Of course, none of the above is possible if your router is not compatible with ExpressVPN. So make sure you have a decent wifi router. There are so many benefits of using a VPN client from a router rather than from the device itself. One advantage is that if your router is preconfigured with a VPN service, it can protect all your devices. All of your devices which are connected to your home wifi will be protected. Their traffic will be routed through the VPN facilities and hence all traffic will be encrypted. As mentioned before, the router itself will count as just one device. Hook that single router with ten more devices and you won’t be doing anything illegal. Theoretically speaking, you can connect an unlimited number of devices from a single account if you use ExpressVPN from a router. But not all VPN service providers give truly unlimited bandwidth so keep a check on data usage. As mentioned earlier as well, if you do decide to flash ExpressVPN firmware onto your wifi router, then first make sure it is compatible with the firmware. If you don’t then you run the risk of bricking your wifi router. And you know what happens when you brick a router right? But only on certain VPN services. If you access Netflix, but get a proxy error message while you are connected to ExpressVPN, then you should contact ExpressVPN live chat support. They can inform you which VPN servers support Netflix at that particular moment. We can’t go into too many details about which servers work with Netflix and which don’t for the obvious reasons. But we can certainly say one thing. With ExpressVPN, you can rest assured that Netflix will work on your device without any problems. What about other streaming websites such as Hulu and BBC iPlayer? The answer is the same. You’ll have to contact customer support and then ask them. You do understand the theme here, right? For clarity’s sake, ExpressVPN will always have a server that will open access to all streaming websites. What good is a VPN service if it has all the features in the world but no speed. You might as well just stick with your regular connection. Because that way you’ll at least be able to access websites. You should have no problems in playing 1080p video on YouTube with ExpressVPN connected. If network conditions are not erratic then you shouldn’t even see the buffer sign. Same goes for online games too. Users can play all the game they want to without noticing significant lag. The only problem with ExpressVPN is that, sometimes the connected drops a bit too frequently. Of course, this problem is not a deal-break by any means. But people who work on the internet and are connected to the internet at all hours might find regular disconnections irritating. Heavy streaming and downloading might aggravate this small problem. And since there is no Kill Switch (and you didn’t know anything about network lock) you might get even more frustrated. to check the speed yourself. Location of the VPN server you connect to. Now that, that’s out of the way, we can happily report that ExpressVPN is a fast VPN service. Perhaps the fastest in the world. It is also extremely consistent on all of its servers. But as indicated before, your experience will depend on your internet connection’s quality and network conditions. ExpressVPN is one of the many VPN service providers that automatically selects the best VPN protocol for its customers. By default, ExpressVPN selects OpenVPN over UDP. Users who don’t want to use OpenVPN over UDP have the option to change the VPN protocol. Without going into too many details, you should know that OpenVPN VPN protocol is the safest and most widely used protocol standard of them all. It is the best option, in other words. In fact, we think it would not be wrong to call ExpressVPN as a completely revamped VPN service. The VPN service is more accessible and unintimidating than ever. That plays well with novice users who don’t want to spend time learning about all the VPN features and tweaks. Of course, other VPN service providers are unlikely to follow suit and will continue to offer a great number of configuration options. Kill Switch feature is fast becoming one of the most marketable and useful features in the VPN industry. Most, if not all, VPN service providers try to offer the Kill Switch feature in an attempt to lure new customers in. ExpressVPN seems to not care much about the Kill Switch feature. The Kill Switch feature essentially blocks all internet traffic when it detects that the VPN connection is unstable or not connected. Whenever the connect drops, the Kill Switch feature moves in and shuts down all internet traffic. There is no need to talk further about the feature, because as we already told you, ExpressVPN does not have it. ExpressVPN also does not offer DNS leak protection. Perhaps someone needs to advise ExpressVPN that encryption strength is a non-negotiable feature in VPN services. There is no point in speeding up the service if your VPN service can’t even secure user privacy and anonymity. This feature works a bit like the Kill Switch feature. But has a different name of course. The Network Lock block all incoming and outgoing internet traffic whenever it detects a drop in VPN connection. This effectively prevents any type of DNS leaks and, as we mentioned before, acts like a Kill Switch. To further strengthen user privacy and security, ExpressVPN coerces all DNS requests over IPv4 protocol. Because IPv6 is not as secure as IPv4 at the moment. 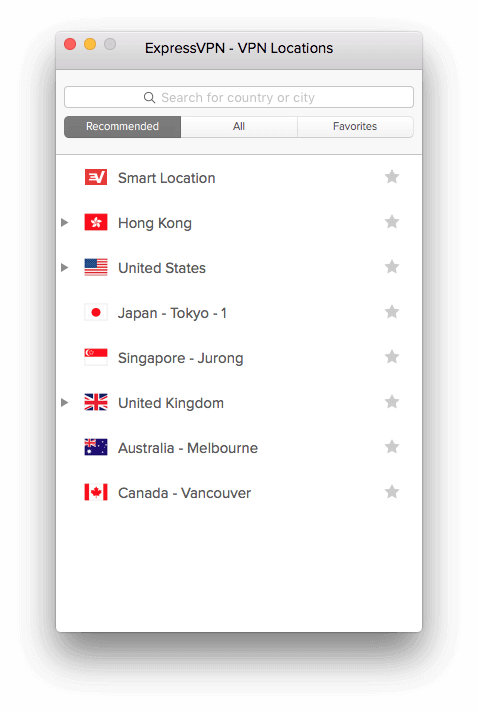 From within the ExpressVPN application, you can check if the server you have selected offers the best download times. The faster the server, the faster will be the download speed. The speed tester tool also displays latency rates and download speeds for all server locations. That is, all server locations that are available within the ExpressVPN network. See, the speed tester tool is great when you talk/write about it. Not so much when you use it. Because it consumes a lot of resources. Sometimes, it can take several minutes to move from start to finish. Moreover, as is the nature of network conditions, the results of speed tester tool vary by the hour. Hence you can’t rely on it to know how good or bad a VPN service truly is. ExpressVPN is a super simple VPN service provider. That should alone be enough for users to not need customer support. But real life is different from official website pages and reviews. You always stand a chance of stumbling onto something you don’t understand. And for those times, there is customer support. Any VPN service provider that wants to make it in this business has to provide excellent customer service. Gone are the days when “we’ll respond back to you within 24 hours” used to sound fast. Now users want instant answers. If not in the form of human help then at least in the form of an excellent FAQ section. ExpressVPN offers round the clock, all week, live chat support. Expect representatives to know a lot about typical VPN problems. During the research period of our ExpressVPN review, we found out that their staff is not only fast but very knowledgeable and professional. The other interesting thing is that you don’t need to buy ExpressVPN subscription package in order to avail the company’s customer support. Even if you’re a potential customer but have a question that is answered, you can easily contact ExpressVPN staff and they are likely to help you out. Of course, in the end, this helps the company attract more customers just before their buying decision. What If I don’t Want Live Chat? There are other options as well. You can contact ExpressVPN via email or a simple contact form. For those of you wondering, no there is phone line which you can call to get help. Perhaps that is the only negative point about ExpressVPN customer support. What About Help On The Official Website? The official website has several tutorials to help newbies as well as veterans out. There is also a FAQ section. If that wasn’t enough, then ExpressVPN also has troubleshooting guides which are pretty comprehensive. All of these mediums are available to the user at no cost. Want to watch live sports using ExpressVPN? There is a guide for that too. The guides are simple and easy to understand. To put it another way, the guides aptly describe how you can use different VPN protocols to access different types of content online. And since ExpressVPN has made quite a name for itself in the industry, don’t expect any spam from the company. That also means, no unsolicited emails with useless promotion packages. One area where ExpressVPN can potentially improve is the user experience of its official website. The whole website is literally flooded with “get ExpressVPN now” official buttons. Moreover, the VPN client also has an advertisement that constantly stares you in the face with the company’s different offerings such as the official blog and/or referral program. Is There Another More Secure Way Of Accessing ExpressVPN Website? There is a .onion version of the website as well. All you have to know is how to use the Tor network. Once you have accessed the dark web, you can simply access ExpressVPN website via its .onion address. To further protect your privacy, ExpressVPN already accepts payments via anonymous methods such as Bitcoin. This fundamentally allows new customers to purchase ExpressVPN service without exposing their location or identity. If you have a device that ExpressVPN does not support then good luck finding a VPN service that does. ExpressVPN has dedicated apps for iOS as well as Android. You should not have problems connecting to ExpressVPN on either platform. 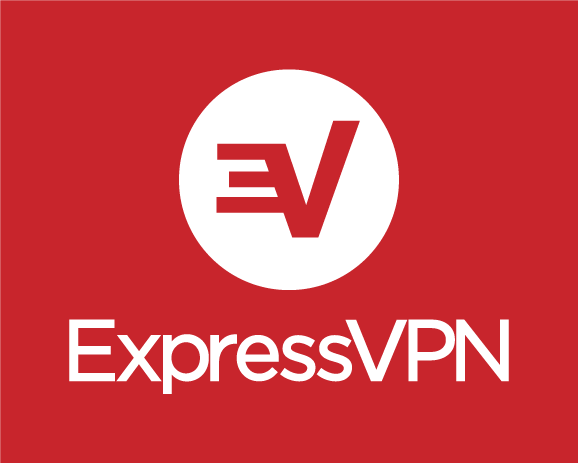 ExpressVPN is the VPN service of the masses. It is truly a one-size-fits-all type of VPN service. Of course, all that versatility comes at a price. ExpressVPN costs more than your average VPN service. But it does come with a great application design along with reasonable security and fantastic performance. The customer service is also pretty efficient. Users who want to have more configuration options should look somewhere else though. We also wanted ExpressVPN to have a bit more on the side of extra features. Potential customers who like to have a single VPN package for the whole family will also not find ExpressVPN feasible. The company should improve the number and quality of simultaneously connected devices. But for users who are looking for a VPN service that is just plug-and-play, there is none better than ExpressVPN. 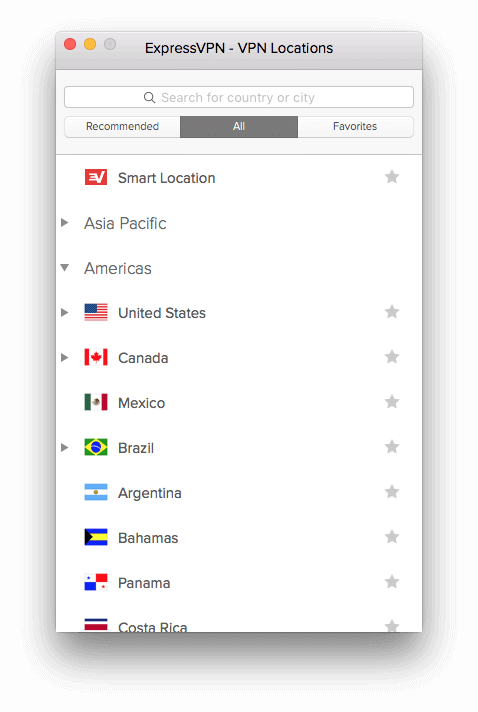 The interface of the ExpressVPN application, on all platforms, is simple and easy to understand. In many ways, ExpressVPN more than makes up for its high cost. And if you still don’t want it, there is always that massive 30-day money-back guarantee to lean on.